Trio Jinx has been hailed as “turning the classical concert into a jam session” by KTEP radio broadcaster Dennis Woo. The trio is classical at its core, but brings double bass, viola, and flute into a distinctive sound world that is orchestral in scope and draws heavily on elements of folk, jazz, and improvisation. 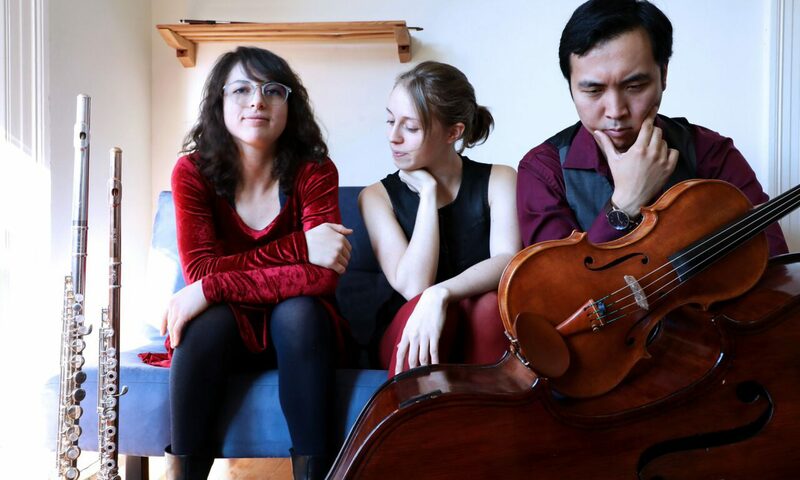 Trio Jinx has held residencies in El Paso, Texas through El Paso Pro Musica; Mesa, Arizona through the Mesa Arts Center; and Milford, Iowa through the Iowa Great Lakes Music Festival. They attended the Imani Winds Chamber Music Festival in New York City. Trio Jinx was invited as a finalist to compete in the Chesapeake International Chamber Competition and a quarter-finalist in the Fischoff Chamber Music Competition in the spring of 2018. They also look forward to being guest artists in the Sitka Summer Music Festival in the summer of 2018. All three members (Louna Dekker-Vargas, Ledah Finck and Yoshiaki Horiguchi) are graduates of Peabody Institute and are proud to call Baltimore, Maryland their musical and artistic home. Trio Jinx is active throughout Baltimore and believes in the potential for music to strengthen communities.